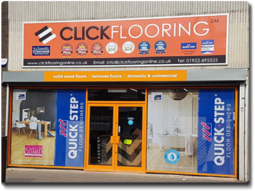 Click Flooring are an established flooring business and have been supplying and fitting flooring successfully for over 20 years, We have 2 retail outlets, one in Birmingham and the other in Bloxwich, Walsall. We supply and fit premium quality hardwood and laminate flooring to both domestic and commercial customers and also supply and fit safety flooring and waterproof flooring. We strongly believe our carefully selected, high quality products deserve to be installed by specialists and that’s where we come in, by choosing us to install your fantastic new floor, you can be rest assured that your flooring will be fully guaranteed. Our specialist installers will pay every attention to detail to ensure you have perfect floor to enjoy for years to come.